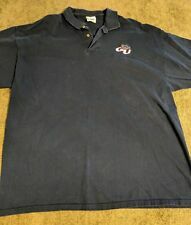 XL Blue GONZAGA BULLDOGS Polo Soft Collar Shirt! Zags! Spokane! Go Zags! A nice looking blue polo or soft collar shirt. This one features the logo for the Gonzaga Bulldogs on the upper left chest. This nice shirt with no rips, tears or fading. Size: XL Approximate measurements: 29.5" from shoulder to waist line. 23" from armpit to armpit. Made from 100% polyester, great dark blue color. Excellent pre-owned condition. Kid's Size Large. Short Sleeve. New Jersey. Get a great item for a bargain! Collar to bottom on back - 28". The shirt is exactly as pictured and is a Adult Small (S) in size. On the front you will see the words Gonzaga with the Bulldog symbol on the front. On the back, it says, "Life is Better in Spokane" with the outline of Washington state and the Bulldog symbol. University of Gonzaga Bulldogs. Color: Collegiate Navy. Material: 100% Cotton. 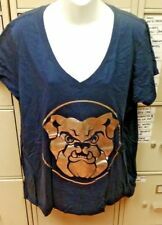 This is a NEWGONZAGA UNIVERSITY BULLDOGS yellow T-shirt with screen print detail on front. 100% cotton. Welcome to Kevin’s Clubhouse! Shirt Measurements: Armpit to Armpit is: 24 Top of Shirt to Bottom of Shirt Length is: 30 Sleeve Length: 21 Item Notes: New Without Tags. $5 to ship! Thank you for visiting the clubhouse! Please message me with any questions on this item! I will be more than happy to answer anything you may need! I don’t cancel orders so if you buy it, please pay. Also, if you have a chance, please check out the rest of my items in my store! We do combine shipping and we also update the store daily with new items for sale! We appreciate your business! You can follow us on instagram @kevinsclubhouse or on facebook at Kevin’s Clubhouse’ Business Page! Item: Gonzaga Bulldogs Tee. Condition notes will not review allowable normal wear such as; sizing, pilling, loose threads, small marks and any issues that are subjective such as color and odor. Gonzaga Bulldogs Youth T-Shirt - Go Bulldogs! - Front & Back Print! Athletic fit tee with bound neck. Bust is armpit to armpit. We do our best to properly and fairly represent each item. 100% Cotton. Screen print.